This cow got mastitis after being in a contaminated, muddy environment for too long. 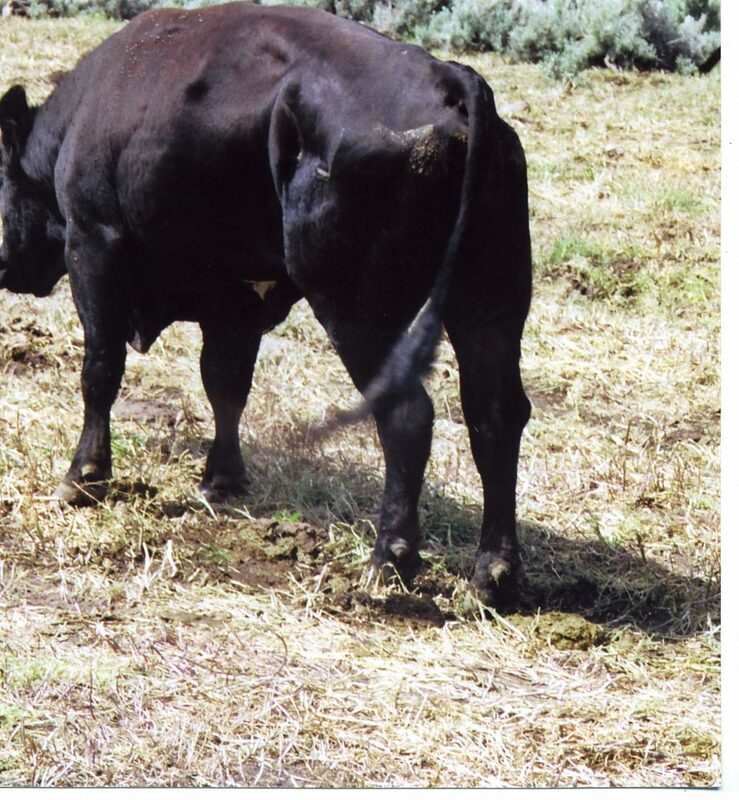 Animals that stood in water and mud may be at risk for foot rot, like this lame bull. Cold stress can compromise the immune system and make cattle vulnerable to disease, like this cow with respiratory problems. Animal stress is a huge issue, but we can’t ignore the human side of this. “This is a time of year that there is normally lots of human stress (calving season, caring for livestock in bad weather) but this year there is extreme stress as producers have been working round the clock to try to deal with the flood issues in addition to the heavy workload associated with calving. As we work with these animals, however, let’s not forget the importance of hygiene, staying clean, not subjecting ourselves to more risk,” Grotelueschen said. The animals depend on their human caretakers, and if the humans get sick there will be no one to care for the animals. “As you treat sick animals, be as sanitary as possible and use disinfectant where needed. Deal with the sick ones last and then change clothes, clean and disinfect equipment, and attend to personal cleanliness. 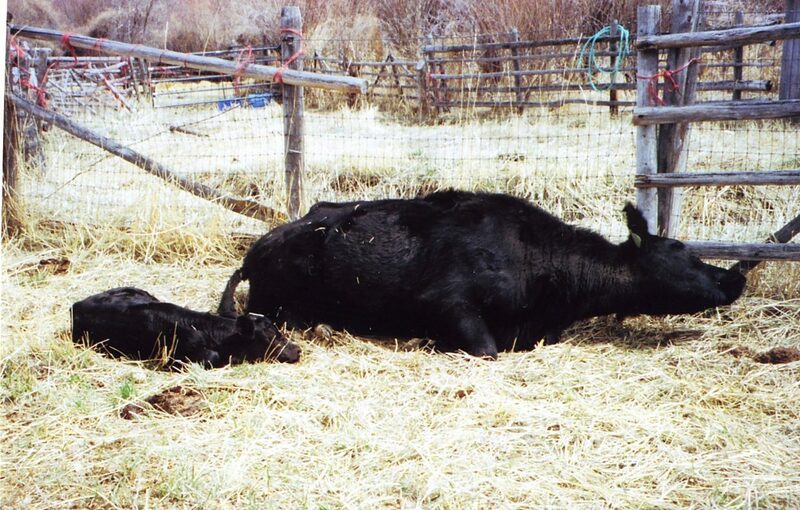 Avoid transmitting animal pathogens into the human living environment as much as possible.” There are a number of pathogens that sick calves can spread to humans, such as cryptosporidiosis, salmonellosis, certain types of E. coli, etc. If the humans handling the animals are tired and have been under a lot of stress, their immune systems are compromised as well. After snowstorms and rain, with deep snow melting in many areas of the Midwest, more than a dozen rivers have been flooding, especially along the Nebraska/Iowa border. Flooding is severe because of heavy snow accumulations earlier, followed by a sudden rise in temperatures. Snow melt, ice jams and rainfall washed away roads and bridges, hindering travel and isolating some communities. John Wilson, University of Nebraska-Lincoln, said several places were severely impacted. Some of these same areas went through serious flooding a few years ago, especially along the Missouri River. "The damage was more concentrated at that time, along that corridor, but not so bad a few miles farther away — depending on how far the river went out of its banks. The flooding this spring is much more widespread — over the whole eastern half of the state, and includes Iowa and Missouri," he said. "We had a nice open winter in January, with above-normal temperatures, and then it turned cold and started snowing. We had record cold in February — the eighth coldest February on record since 1895. The ground was frozen, the snow got deep and didn't melt, and then we got rain and rapid melt. It was the perfect line-up of things that could go wrong to create the flooding." "Many producers got hit with floodwater right in the middle of calving, so that was a problem, along with loss of pasture — silted over and buried in debris. There have been some huge cattle losses," Wilson said. "A good friend of mine knows a rancher near the South Dakota border, next to a major river with a dam. The flood washed out the dam. The rancher had about 250 cows that were soon to calve, and he went to their pasture with his tractor and a round bale, to lead them to higher ground. They were all following him, and he happened to look back and saw a huge wall of water coming at him, when the dam broke. He dropped the bale and got out of there as fast as he could with the tractor. He escaped the water but it swept away all those cows. In the days following, they were finding cows dead for miles, downstream." The flooding isn't over, with more rain in the forecast. "With all the rain in the Dakotas, some of their snow pack will be melting and coming downstream. Many places still had 1 to 2 feet of snow in late March. Whatever doesn't drain into the Red River will be coming our direction," Wilson said. Feedlot operations with lagoons now have a problem with those being full and overflowing. "It's too wet to pump them and spread it on the fields, so this will be another challenge," Wilson said. Dale Grotelueschen, DVM, MS and director of the Great Plains Veterinary Educational Center, University of Nebraska, at Clay Center, Neb., said the combination of a severe winter, the wet/cold and flooding has resulted in seemingly insurmountable challenges for some stockmen. "We realize there is a lot of nutritional stress that has accumulated through the winter as well as from present conditions. Alleviating it, wherever possible, is important for managing the health of these animals, but present circumstances make that very difficult," he said. With all the mud/moisture there's concern for diseases like foot rot, pneumonia, mastitis, etc. The stress these cattle have gone through makes them more vulnerable to many diseases. Veterinarians at the Red Barn Veterinary Clinic in Oakland, Neb., have been working with clients whose cattle were caught in the flood. They said that in their area there were only a few operations impacted; most of the ones with potential to be in trouble were able to move their cattle to higher ground before the flood hit, but a few were unable to do that. "There were some calf losses due to flooding, and cows that were separated from feed. There are some areas where huge gullies washed through the pastures, which made it difficult to get to those animals. A few of our clients had animals standing in water for a long period of time. Cold water can be stressful, lowering the core body temperature on those animals. As we all know, stress is a precursor to many disease issues in livestock," one of the veterinarians said. "Respiratory problems will be one of the big issues. There may also be questions about pregnancy status in cows. At this point in time I don't know of any cows that aborted due to that stressful event, but this is definitely a possibility. Lack of feed, being in cold water, etc. could be detrimental to trying to maintain a pregnancy, with potential for abortion," he said. "I suspect we will see some disease problems in the cattle that had to stand in the mud and cold water for an extended period," he said. "We'll know more after a little more time has passed, after we've had a chance to get close enough to the cattle to assess them and see what's going on." It will be difficult in some situations to monitor them until the producers can get access to those cattle. Grotelueschen said there's been a lot of stress on herds, whether it's cows, calves or feedlot animals. "Stress plays a role in immune suppression, so we can expect health issues that are more severe than most years. 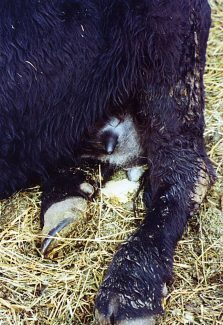 Calving cows and heifers under this kind of stress and these conditions may be less able to mother their calves, and we can assume that many calves were unable to nurse and get sufficient colostrum or did not absorb sufficient colostrum. We know that cold stress reduces colostrum absorption, so even if some calves did nurse they may not have gotten enough of the antibodies they needed," Grotelueschen said. "Many calves may not be as hardy, from an immune standpoint, through the rest of the year and in the feedlot later. From a management perspective, we need to try to reduce the stress and manage the risk for disease," he said. With some of the conditions ranchers are facing, this may be a challenge. "In herds that are calving, if there's any way to get animals out of the mud, this would be best, but after this flooding there are limitations. Some ranchers don't have any dry ground. In a calving situation, however, if a person can move the calving cows to new areas and leave calved-out pairs behind (Sandhills calving system), even if the ground is muddy it won't have the level of exposure and contamination with scour agents and will reduce the risk of disease in new calves," he said. In some circumstances, however, floodwater may have brought new pathogens or contaminants to pastures. With all the debris, and damaged fences, there's also the risk for injured animals. Some may have been caught in fences, or had to wallow through material that caused lacerations or puncture wounds. "Injured animals need immediate attention, if possible. Producers need to work with their veterinarians on how to address some of these problems. It often takes a team effort to care for them," he said. Producers need to monitor livestock as closely as they can, since some animals will become sick due to stress and compromised immunity. Trying to meet nutritional requirements will be important, since many feed sources have been damaged by water. "The severity of the winter just prior to flooding certainly compounded the seriousness of the present situation," Grotelueschen said. "Many cows had lost body condition even before the flood, which contributed to some of the issues we're dealing with today." Many feed supplies have been lost. "Hay was scarce to begin with this winter, because of the deep snow we had earlier," Wilson said. Fall pastures were snowed under, and ranchers couldn't run cattle on cornstalks as long as they wanted to. They had to supplement with hay and try to find hay. Hay is scarcer now, with floodwater damaging much of what was left." "I recently talked with a guy who runs a dehydrator plant (processing alfalfa hay into pellets) situated along a creek. He had 700 round bales of alfalfa plus a large pile that had already been ground up, and all of it was ruined by the flood. Now he has to try to figure out how to dispose of it. There is one place on his property where Logan Creek goes through, and after it flooded he had several acres covered with piles of cornstalks 2 to 3 feet deep that washed in there. There were also deep piles caught in the trees and along fences bordering his fields," Wilson said. Many cornstalks floated around in the flood, jamming into and taking out a lot of fences. Country roads were also damaged. "A road near my place has gullies several feet deep. Where the main track was — and the ground firmer — you can still see the gravel on top, but on each side of those tracks the softer ground washed away. It will be a huge expense to the county to repair these roads," he said. Stockmen in many regions were unable to get to some of their animals to feed them. Some of the available feed is no longer safe to feed. "Anything exposed to water now has to be destroyed, according to our Nebraska Department of Environmental Quality. You can burn it, if it's on your own ground or contiguous piece of ground, but you can't haul it 5 miles down the road to another piece you own, to burn it there. It can be burned (if it doesn't need to be hauled) or composted, or hauled to a landfill. This will be a huge expense," Wilson said. Nutritional stress will be a big problem for many animals. "Some cattle in various parts of the state are now isolated because of roads and bridges out, and people can't get feed to them. In some places the cattle don't have access to water now that the snow has melted and floodwater receded." Some water sources are contaminated.